Have you heard of Paparazzi Accessories? I have seen some advertisements for this company on Facebook, but I never looked into it. I of course said yes when Jill Valero contacted me and asked me if I would like to try it out for free. I did not know that I would be starting a new obsession. The best thing about Paparazzi is that everything is $5! 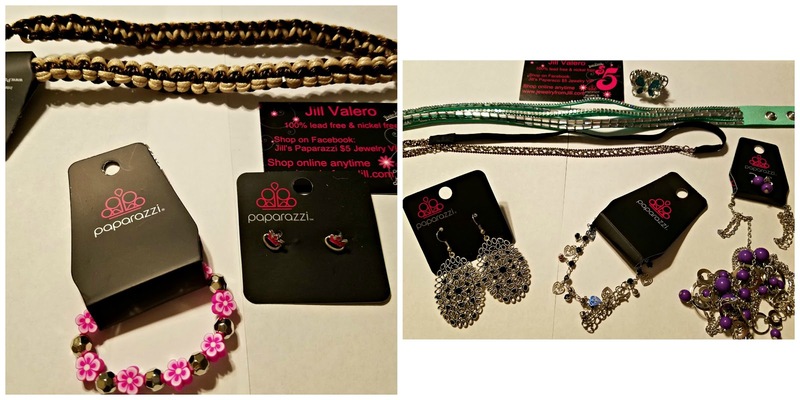 Paparazzi has necklaces, bracelets, earrings, rings, and hair accessories. They even have some children and Men accessories! I'm a stay at home mom of 4 kids (ages 12, 7,5, and 2). We homeschool our kiddos and I run an awesome jewelry business from home. I sell Paparazzi Accessories. Everything is 100% lead and nickel free which was a BIG deal for me, because I have super sensitive skin. This is the only line of fashion accessories I've ever been able to wear without a reaction.New items are released on my website www.jewelryfromJill.com every single weekday (Mon-Fri) so the selection is constantly changing to keep up with the current fashion trends. There aren't any catalogs or any crazy sales pitches, just great jewelry at great prices for every budget. You can also shop and join shopping parties on Jill's Facebook page. Another cool thing about this jewelry is that the same piece may be available in multiple colors. Here is what Jill sent me to try out. I didn't think I would like this bracelet when I first received it. It looked odd in the bag. However, after I tried it on I fell in love with it. You can wear it a few different ways and you may even be able to fit it on your ankle. I am excited to wear this out for a night of dancing or to concerts. 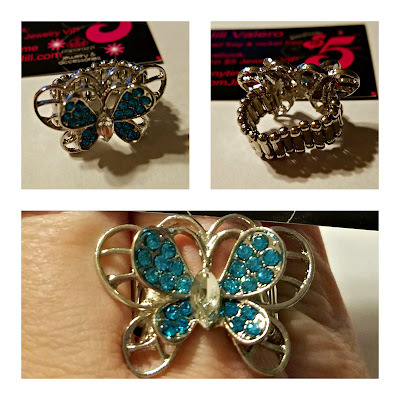 This butterfly ring reminds me of my Mom who passed away a few months ago. She loved butterflies. She would have loved this ring. All the rings have a stretchy band that allow them to fit multiple sizes. They are recommended for sizes 6-9, but that is flexible. This pair of earrings did not photograph well. They have really pretty little green gems sporadically in the pattern. They are a little larger than I typically wear, but they are pretty. I am expanding my style with these which is fun. This bracelet is SO ME. It has little round green gems (again, they didn't photograph as well as I would have liked). This bracelet is very pretty and would make a great gift. They also have Men's jewelry and Children's jewelry. 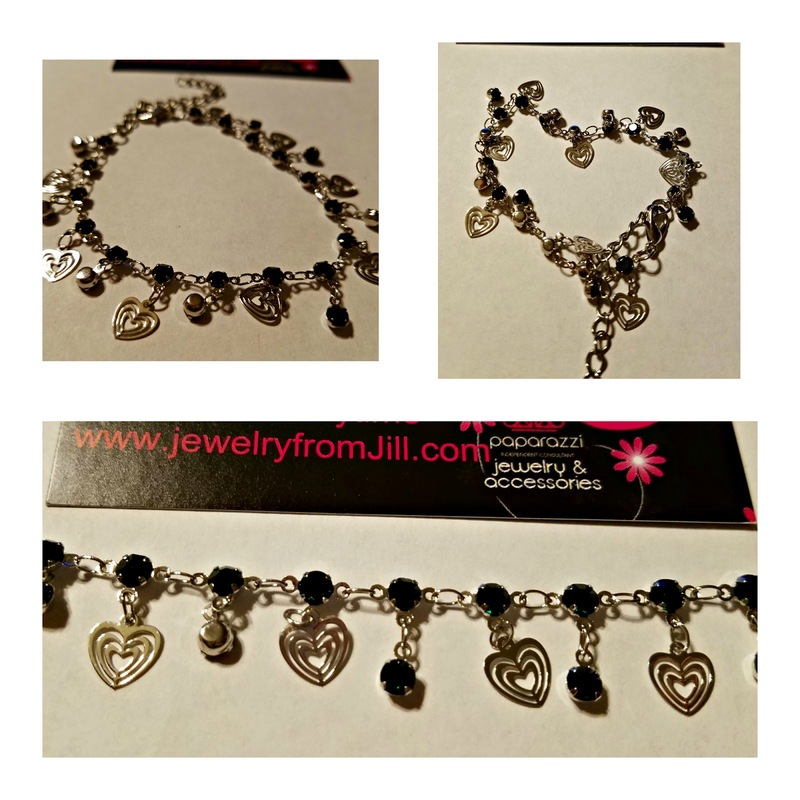 Jill send me the Men's choker pictured on the left side and the flower bracelet and earrings for little girls. The children pieces are only $1! The picture on the right just shows several of the jewelry pieces together. This is a REALLY long, stylish purple necklace. Guess what? Necklaces come with free earrings too. Yes, only $5 for this set. AMAZING. I forgot to take a picture when I wore this the other day, but it is so long that I couldn't fit it all in the picture. Sparkly headbands? Yes, Paparazzi has those too. Jill sent me this one. Headbands aren't really my thing, but this is really pretty. My friend is going to love it when I gift it to her. For me the ultimate compliment that a review can give is when they make a purchase from the company that they are reviewing. I have done this not once, but twice since I received the initial package a little over a week ago. This was my first small purchase. I LOVE all three items so much. The black bracelet is coming with me to the Rise Against concert tomorrow. I have worn both earrings already too. My second order was just shipped. Shipping is only $3.50 (although she has some free shipping specials sometimes too) and it is super fast 3 day shipping. You will not have to wait long for your jewelry. Inventory is always changing, so make sure you check out what she has available each time. Don't hesitate or it will sell out quick. She always lists how many of each piece is available. Make sure that you follow Jill on Facebook and look out for the next party! I will see you there. I LOVE Paparazzi jewelry!!! Too much fun for only Five Bucks!! Thanks so much for the wonderful review! I'm glad you love the jewelry! It's quite a fun addiction and one without guilt since it's affordable! Wow, amazing pieces of jewelry! So cute at affordable. Thats awesome.